This race comes down to two questions: What kind of future do we want for ourselves, our kids, and our grandkids? And how do we make it a reality? That’s his way: one person getting supreme power and exercising it ruthlessly. It’s why he admires dictators like Vladimir Putin so much. But that’s not how change happens in America. It’s never just about one person — not even someone as powerful as the president. Every good thing our country has ever achieved has always happened because people have worked together to make it a reality. We see that every day across America. And I’ll bet you’ve been a part of it. Maybe you’ve taught kids to read or cleaned up your local park. Maybe you’ve organized a cancer walk or run your church’s food drive. Whatever it is, chances are, you’ve done something to serve your community — and by extension, your country. This is one of the best things about the American people: We’re doers. We don’t just shrug our shoulders when we see something that needs fixing. We roll up our sleeves, and we get to work making things better. That’s been our story — the American story — since the beginning, and it’s still going strong today. For many Americans, serving our country has included serving in our Armed Forces. There’s no greater service or sacrifice, and we’re grateful to our men and women in uniform — to their families and our veterans — every single day. But national service takes many forms. And I believe very deeply that all of us, at every stage in life, from grade school through grand-parenthood, can find a way to give back. Every day, AmeriCorps members are out there building houses, responding to natural disasters, and helping people with disabilities find jobs and homeless families find safe places to live. Every day, City Year members are working with students at risk of dropping out of school. They’re tutoring, mentoring, running after-school clubs — all to help young people discover how capable they really are. Every day, Peace Corps Volunteers are teaching English in Kosovo, staffing health centers in Nicaragua, supporting farmers in Nepal, and distributing malaria nets in Uganda. Maybe you’ve been a part of one of those programs — or maybe you serve in a different way. But however you serve, it feels good to be a part of something bigger than yourself — to take our time and labor and put it toward something good happen that can happen in our country and the world. And service does something important for us as a society. Too often, we Americans can become separated by each other — and a lot of people are feeling that way this election. There aren’t many places where people of all ages, all races, all backgrounds, all beliefs come together in common cause, but service is one of them. And that’s one more reason why I think it’s so valuable: because it helps us to reconnect with each other, and to feel more a part of our shared American life. So what if we, as a country, made it easier? What if we created more service opportunities for Americans of all ages? What if we all strengthened the culture of service in our country, so it wasn’t just something we did one day a year, but instead became a regular part of our lives? Wouldn’t that tap into something great about our country? If I’m elected president this fall, I will make a major push in support of national service. First, let’s triple AmeriCorps. Every year, there are hundreds of thousands more applications to AmeriCorps than there are spots. Let’s grow the program from 75,000 annual members to 250,000. And then let’s double the college scholarships that AmeriCorps members earn through their service. Second, let’s grow the Peace Corps. Since President Kennedy launched it 50 years ago, it’s given thousands of Americans the experiences of a lifetime, and it’s fostered friendship and cooperation among people of dozens of nations. Third, let’s expand service opportunities for people of all ages. The younger generation is already deeply thoughtful about how their lives impact others and the world. And I’ve been impressed by how many young entrepreneurs build some kind of social component into their business — whether it’s giving their employees designated time off to volunteer in the local community, providing matching funds to local service organizations to help them reach more people in need, or adopting a school or community center as a pro-bono project for the whole company. That’s why my student debt plan includes loan forgiveness if you launch a social enterprise, or if you start a business in an underserved community. We should make it easier for young innovators to follow their dreams while honoring their values and giving back. Now, I also want to get older Americans more involved, so that they have an encore opportunity after they’ve finished their formal careers. 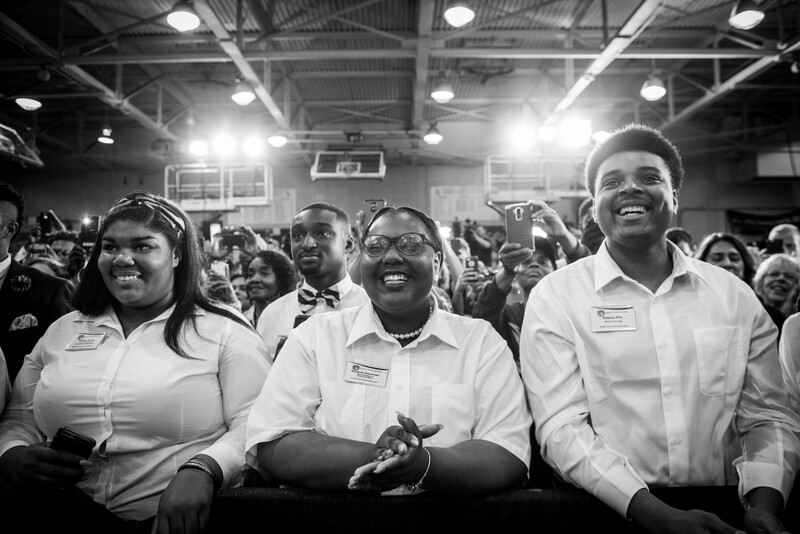 I intend to make sure 10 percent of AmeriCorps slots go to Americans over the age of 55. Finally, I want to create a new means for people to serve in serious, meaningful ways without a full-time commitment like AmeriCorps or the Peace Corps often require. The Armed Forces Reserves is a great model — it gives people the chance to make a high-impact contribution, while still building careers and pursuing their dreams in other ways. Let’s do something like that in the civilian space: We’ll call it the National Service Reserve. If you join the National Service Reserve, you’ll receive some basic training. And when your city or state needs you, you’ll get the call. It may be a few hours a month or it may be much more, depending on what the need is and how much time you can devote. Say a natural disaster strikes, and the Red Cross needs all hands on deck — or something like the crisis in Flint occurs, and clean water needs to be distributed every day to families — you’ll be sent into action. Our goal is 5 million people, spread across all 50 states, with a special focus on people under 30, who’ve said again and again that they want to have a bigger impact in their communities, but can’t leave their jobs. We’ll work with governors and mayors, Republicans and Democrats. And this has got to be a true bipartisan, public-private partnership, because businesses and universities have unique resources to offer — and because we want workers and students to know that, as they make this contribution, their schools and their employers have their backs. Now, I don’t think you’ll hear anything about this from my opponent. And that’s a shame, because national service has always been a bipartisan goal. And at times like these, when it can be hard to find common ground, it’s even more important that we come together where we can. In a country founded on liberty and equality, I can’t think of a more important notion than that every single one of us is valuable — we all deserve respect, we all should listen to each other, we all can make our mark on the world. And when we come together in common purpose, we can do so much more than we can on our own. That’s why “stronger together” is more than a slogan — it’s a course of action.